I figure if I’m going to make and consume something it better be worth it and these suckers are totally worth it. 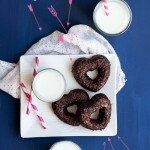 They’re deeply chocolatey but not too sweet, with a rich, fudgey frosting. Both the batter and the frosting include sour cream. 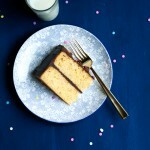 It makes the cake tender and moist, and the ganache-like frosting a little bit tangy. Also, can you believe in nearly 8 years of blogging I have never made a chocolate cupcake with chocolate frosting? I’m pretty sure that means I’ve begun 2016 on the right foot. 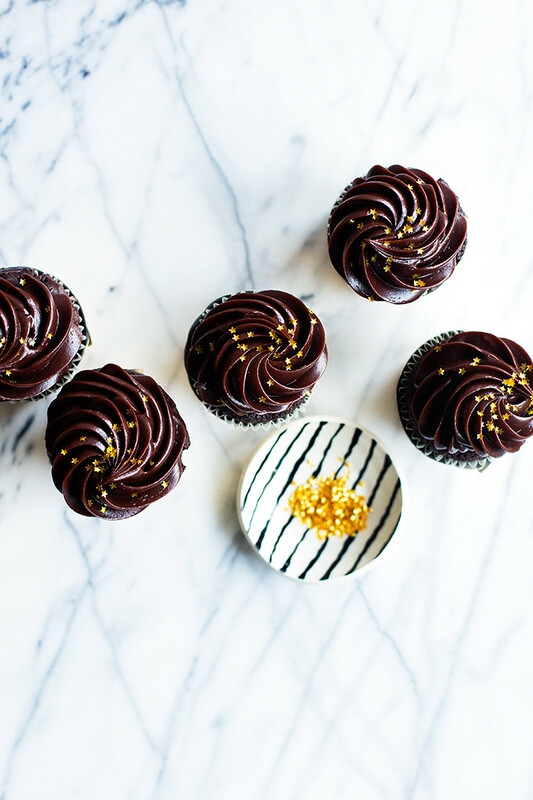 Double chocolate cupcakes laced with tangy sour cream in both the batter and the rich dark chocolate frosting. Preheat the oven to 350°F. Line a cupcake tin with 12 paper liners. In a large mixing bowl whisk the flour, cocoa, baking powder, baking soda, and salt. In another bowl beat the sugar, oil, sour cream, water, eggs, and vanilla together. Fold the sour cream mixture into the flour mixture--the batter should be pretty smooth and free of any large lumps. Divide the batter between the 12 lined cups, filling each about ¾ full. Bake the cupcakes on the center rack of the oven for 25-28 minutes, or until the tops spring back to the touch. Remove from the oven and cool on a rack before icing. To make the frosting, fashion a double boiler by setting a heatproof bowl over a pan of simmering water--making sure the water does not touch the bottom of the bowl. Add the chocolate, butter, and corn syrup stirring every so often until melted and smooth. Remove the bowl from the heat and set aside to cool for about 10 minutes. Beat in the sour cream until smooth, followed by the confectioners sugar. Chill the frosting in the refrigerator for about 30 minutes, stirring after 15, until the frosting thickens up but is still soft enough to pipe or spread onto the cooled cupcakes. 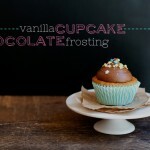 The frosting recipe makes a generous amount, more than enough to liberally frost each cupcake. I’m so there with you – if I’m eating treats in moderation then they better be the best damn treats I can get my hands on! 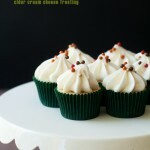 Love the idea of the sour cream in the frosting – I can almost taste the tanginess already! Yes, yes, YES! 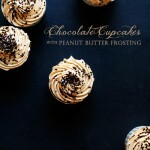 If cupcake perfection exists I think you nailed it with these! Happy New Year! You totally started 2016 the right way. These are GORGEOUS Cindy. Your piping skills are amazing. And I’m glad the recipe gives you extra frosting because I’d totally eat that straight out of the bowl. The frosting is so dangerous! The little stars on these are SO pretty!! And I freaking love all the chocolatey-ness of these cupcakes. Yum! Thanks, Katrina! I love those stars…there are heart ones too! Agreed! The stars were such a nice touch! A little bit of sparkle goes a long way. Ohmygawd, that chocolate frosting is so glossy and beautiful! Cheers to more cakes in 2016 (and Happy New Year)! Ahhh these are so beautiful and New Year’s-y!!!! They’re chasing all my post-holiday blues away. And sour cream in both the batter and frosting = yes, yes please. These are the prettiest cupcakes / cupcake photos!! I love the light on that swirl of frosting! And I looove sour cream in frosting…that tangy-ness is so good! Hell yes. Thank you so much for not posting a kale salad ;-) These look amazing! YASSSSS!! Doing it right for 2016.. These cupcakes are things of beauty!! Love these bright, beautiful photos Cindy!! And that frosting…omg. It’s so perfect. Pinned twice!!!!!!! Salivating!!!! Did you use a special cupcake pan? They look so tall… Also, where did you get the pretty stars? The cupcake holders are a bit taller, but you bake them inside of the gold covers, so they hold their shape on their own. They came from the shop bakeitpretty.com and come in a pack of 6. I used 6 and baked the rest in standard liners–they hold pretty much the same amount of batter. The stars are Wilton Edible Glitter Stars. I’m pretty sure you are missing sugar from the ingredients of the cupcakes. It was, thanks for catching that!! I love the idea of swapping greek yogurt! I’m so glad they were a hit! 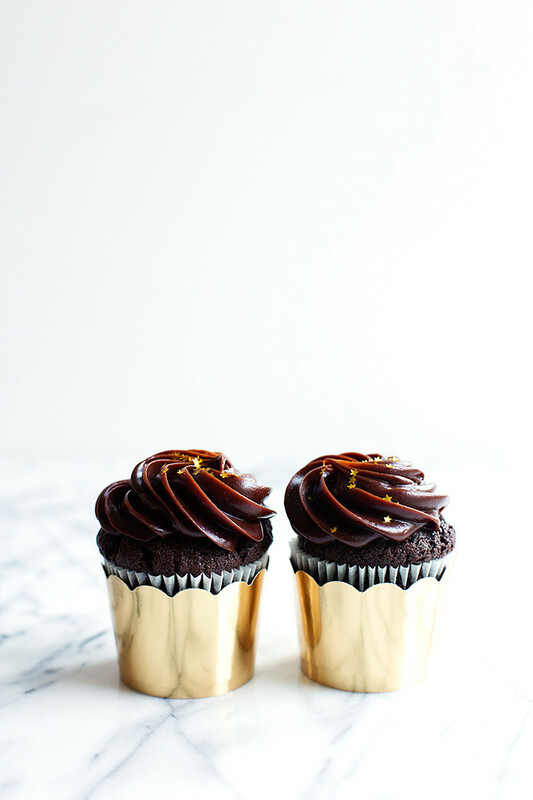 I have a confession to make…I love the sour cream chocolate frosting from a can…love that you made it from scratch…these cupcakes…LOOK AMAZING! Canned frosting was all I knew for like, the first 20 years of my life! Ha! Thanks for posting these for my birthday! You are the bomb! Hello! These cupcakes are gorgeous- the gloss on that frosting, mm. I just wanted to ask what percentage of chocolate you used in the frosting? I only have 80% to hand! But I think that could be too bitter. I also have semisweet and bittersweet baking chips. I actually used bittersweet chips from Ghirardelli (70%). I think any of those will work, though I think you’re right that 80% may be too much. Hey! 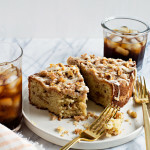 The recipe looks yum!! 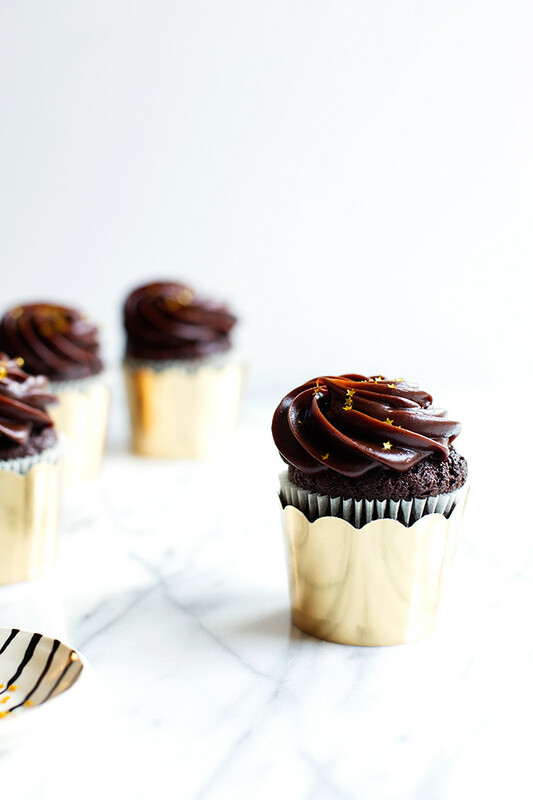 Im drooling over the chocolate cupcakes right now… had a question… sour cream is not really available at hand (in India) …can i substitute sour cream with something else?? Someone else had success substituting thick yogurt for the sour cream, so that could work! Wow, that frosting looks luscious. I don’t even remember the last time I used that word, but it’s definitely the perfect adjective. Good job capturing its shininess in your photos. Can’t wait to try this recipe. These look so decadent and I love the wrappers! So pretty!